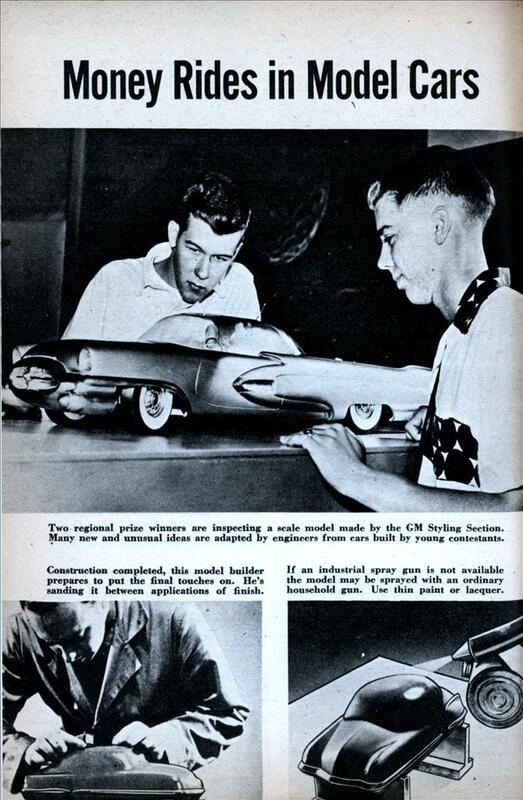 For young people with imagination, here is an opportunity to design and build model autos. Awards wait for the best. EACH year, $65,000 in cash and scholarships is awarded to youthful builders of model automobiles, by the Fisher Body Craftsman’s Guild. The awards are made on the basis of two categories, design and craftsmanship. The contestant must design his own model, although he is supplied with instructions and worksheets in a kit supplied by the Guild to all interested persons. If the contestant can’t draw, the design may be worked up. from clay. Since clay doesn’t stand up under shipping, however, the final model must be rendered in wood or plaster from the clay mock-up. Models can be made from a variety of available woods such as balsa, cypress, white pine, basswood or soft mahogany, either in solid or laminated blocks. For those with experience in constructing model airplanes, automobiles can be built by making a framework and covering it with balsa sheets. One of the most important aspects is that of finishing. The surface of the model must be perfectly prepared, as imperfections can’t be hidden by painting. First, wood and plaster models must have several coats of sealer, allowing a few days between applications. Final finish is applied, again sanding between coats. The last coat of finish is buffed, waxed and polished to a high gloss. All model cars are judged by an established point system based on a breakdown of craftsmanship and design. Designs are • evaluated on the basis of originality, artistic merit and practicability. Craftsmanship is judged on fidelity to scale, workmanship, painting and finishing. ? I made and entered a model to Fisher about the time this article was printed. Made it first in clay to get the templates. Then used those templates to cut it out in soft pine I had laminated into one pine block following instructions. Got a third place cash prize which didn’t cover cost of shipping but the experience to me was worth much more. Wonder how many “third prizes” there were? They did return the model which was always good for a conversation piece. Good story. $65,000 in prizes and they stiffed you for third place? 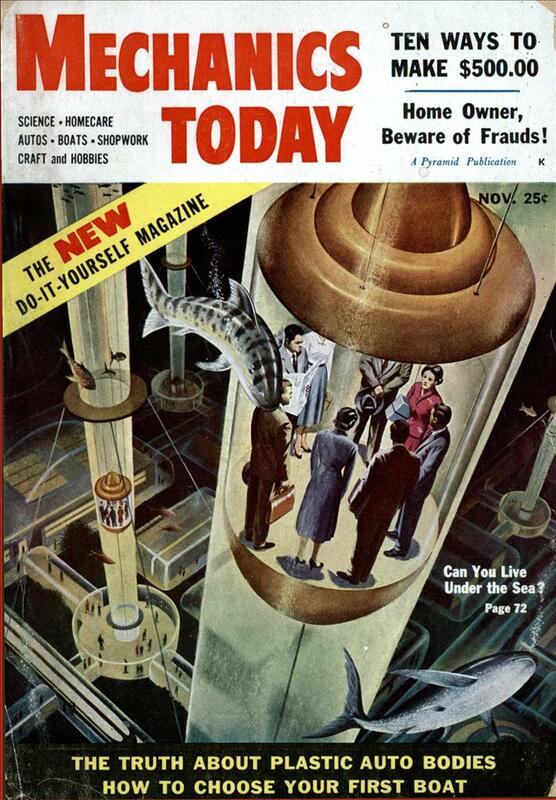 I wonder what would have happened if someone came up with what we would consider today a “modern design” – ie no fins. Do you still have the model? or its picture? I would love to see it if you could post a link. blueferretdog: I no longer have it but know I have a an old Indianapolis newspaper picture of myself with it around here someplace. There once were a couple of pictures which I haven’t seen in decades. See what I can find and try to figure out how to securely post it. The best I can remember is that it did not have fins but did have a large rear sloted combination exhaust and bumper area to serve for a gas turbine engine. Jet planes really had an impact on car designs in those days. George: That link was a big help in bringing back my memory on the actual prizes and the three ways they were broken down. It shows in 1956 ( a year after I won a prize and certicate): Top prize was $5,000 for national winners, $1,000 styling and various state winners $50 – $150. Hence, In 1953 I assume the $65,000 was distributed to a large number of young designers as it must have been in later years. Wish such a goodwill incentive was there for our design-minded youth today besides just American Idol. After 1968 it was gone; another bye bye American pie. I have one of the 1950s rule books for this competition. GM got the rights to all designs, even though they were designed by minors (boys in high school). Don’t think this would stand up in court today, but who knows?